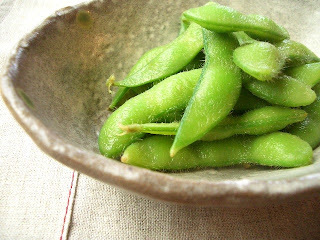 Beans are a great vegetable food and very much present on the Japanese table. BEAN, BEANS and PEAS just like that (mame, too 豆、まめ ) is not a kigo in Japan but a non-seasonal topic. There are many varieties of plants and they are mentioned with their names to become kigo. There are also a lot of human activities involved in harvesting the beans, many of them are kigo. The Japanese word "mame" can also be synonym for something "small". Beans are classed as pulses whereas soybeans are classed as oilseeds. The word "soy" is derived from the Japanese word 醤油 (shoyu) (soy sauce/soya sauce). Let us look at some kigo with the beans. made from red adzuki bean paste. Natto are fermented soy beans, a speciality from the Mito area, now eaten all over Japan. They are harvested on the branches and boiled for a short while. Sprinkled with salt on the pods, each person shells them for himself. They are quite a delicacy with a cold beer. 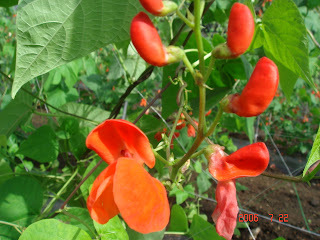 These beans originate from Central Africa, but are now widely used in Japan. Click HERE for some photos of the beans ! In our area, they are often dried on the roadside, hung over the metal road protections. Other farmers spread them straight on the road asphalt, leaving barely space for one car to pass by. Also listed in the SPRING section of some saijiki. one sun 寸 is about 3 cm. This haiku shows the great attention to details of the poet. aka no meshi, sekihan 赤飯,　red azuki beans with rice, is cooked to celebrate many events in the human life. It is an old Chinese custom to remember the red rice varieties of olden times. ***** . Bean sprouts (moyashi 萌やし) . ***** . daizuko 大豆粉 soybean flour, soy flour .